Huddle may be set on an icy tundra but it’s impossible not to warm to this tale of a father penguin and his fearless young chick. Joseph Barnes-Philips and Victoria Dyson ‘speak’ entirely in squawks and hoots but give such effective physical and vocal performances that you feel like there’s a conversation taking place nonetheless. Barnes-Philips in particular is just joyful to watch, from the first moment his face lights up in a smile at the sight of this audience of two-to-five year olds. 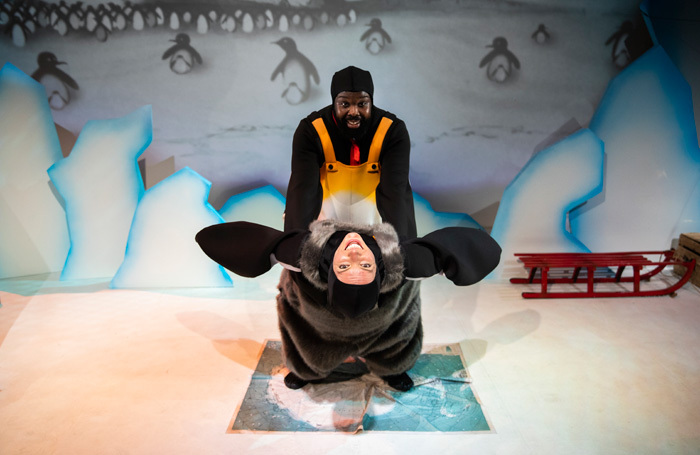 The story Filskit Theatre tell – penguin finds egg, penguin hatches egg, penguin raises chick, chick gains independence – is a simple one, leaving plenty of space to get to know these charming characters. Owen Crouch’s sound design and composition and Ioanna Varsou’s animation enrich the storytelling beautifully, creating texture while also playing a vital role in offering clues to mood changes and advance warning of the trickier plot points. Fifty minutes might have been a stretch for some of the very youngest audience members but Katy Costigan, Sarah Shephard and Victoria Dyson (Filskit’s artistic directors devised the show together, with Costigan and Shephard credited as co-directors) ensure that no one is left behind.